Website about New York, Chicago and how to travel between those two cities. 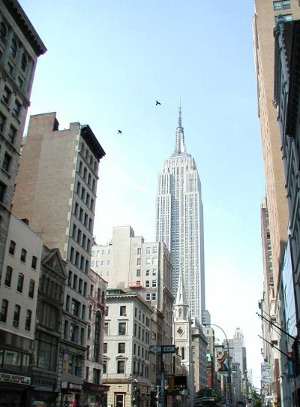 New York, also known as the "Big Apple", is situated on the East Coast of the United States. The city center is located on Manhattan island. It is the largest city in the United States and one of the most important cities in the world. The Metropolitan Transportation Authority (MTA) runs the largest public transit system in New York. It includes Subway, Buses and two commuter rail networks (Long Island Rail Road and Metro-North). The subway trains, which are in service 24 hours a day, are identified by letters and numbers. There are local and express lines, which do not stop at all stations. Between Manhattan, New Jersey and Newark, the Port Authority Trans-Hudson (PATH) operates a rapid transit system independent from the MTA Subway. The trains are identified by colors. Similiar to the New York Subway, some of its lines run 24 hours a day. Regional rail service from New Jersey to New York is run by New Jersey Transit. As New York stretches over several islands, transportation by ferry is also very important. Most of the ferry services are coordinated by New York Waterway. The free Staten Island Ferry is owned by the City of New York. New York also features an aerial tramway: The Roosevelt Island Tramway between Manhattan and Roosevelt Island. Nieuw Amsterdam: New York was founded as Nieuw Amsterdam by the Dutch. It was renamed when surrendered to the British. Latitude: New York has about the same latitude (40° 43´North) as Naples, Italy, in southern Europe. The 'L' in front of 35 East Wacker Drive. Chicago, also called the "Windy City", is located on the shores of Lake Michigan in the Midwest. Its metropolitan area is one of the biggest in the United States, after New York and Los Angeles. 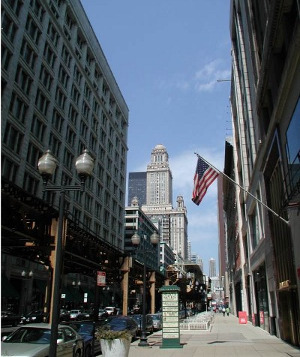 The Chicago Transit Authority (CTA) operates an extensive bus and elevated train system. The elevated train, called the "L", actually runs as well as an underground train in parts the downtown area. The "L" serves both O'Hare and Midway Airport and most lines run in a circle around the downtown area, hence called "the Loop". The different lines are identified by color as well as final destination. Apart from the elevated train, there is also an extensive network of suburban trains operated by Metra. These trains run much faster than the "L". Most of the lines, identified by name and assigned color, start at Union Station or the Ogilvie Transportation Center just west of the Loop. Reversing the river flow: In order to "solve" the problem of polluted drinking water from Lake Michigan, the flow of the Chicago River was reversed, so its waste-water would not flow into the lake but towards the Mississippi. Beaches: Although not at an ocean, Chicago does feature quite a few sandy beaches along the lakeshore. Skyscrapers: Chicago was home to the first Skyscraper, the Home Insurance Building built in 1884. Flights between New York and Chicago take around 2 hours 30 minutes. When adding the time to get to the airport and through security, this can easily increase to 6 hours and more. Round trip tickets are usually sold at 160 $ and up. Low cost carriers as well as special promotions might offer cheaper flights. As this is a very popular route, there are many airline companies flying from New York to Chicago. All major US companies (United, Continental, American Airlines, Delta, US Airways) have the two cities in their network. Low cost carriers serving this route include Southwest Airlines, JetBlue and Spirit Airlines. Chicago's main airports are O'Hare International Airport and Midway International Airport. Both are connected to the CTA elevated train and bus network. From O'Hare, the Blue Line takes you downtown in about 45 minutes. From Midway, which is closer to downtown, the Orange Line brings you to the city in about 25 minutes. Alternatively, a taxi needs between 25 and 90 minutes from O'Hare and 15 to 40 minutes from Midway. There are two other airports in the Chicago Area (Gary Chicago Airport and Chicago Rockford Airport), but neither of them currently hosts scheduled flights to New York. John F. Kennedy International Airport (JFK) is located in Queens, about 12 miles (19 km) from Manhattan. An airport shuttle train (The AirTrain JFK) connects the airport to the subway, bus and the Long Island Rail Road. The shuttle has two branches, one leading to Jamaica Station (Long Island Rail Road, Subway E, J and Z Trains) and one to Howard Beach Station (Subway A Train). The trip downtown is, with about 40 minutes, a bit faster using the Long Island Rail Road at Jamaica Station than by subway (60-70 minutes). Taxis and shuttle buses can make the trip in 35 minutes if traffic conditions are good. LaGuardia International Airport (LGA), in the northern part of Queens, has only one way to be reached by public transit: by bus. Visit the airport's website to find out about the bus routes most convenient for you. The bus or taxi ride from downtown takes 40 to 60 minutes. Newark Liberty International Airport (EWR), 15 miles (24 km) west of Manhattan in New Jersey, has an AirTrain that connects to New Jersey Transit and Amtrak trains at Newark Liberty International Airport Station. Reserve yourself 40 min to 1 h 10 for this trip. Coach USA also offers a direct bus from Newark to New York City: the Newark Airport Express. Travel time on this bus is about 40 minutes. Of course there are also taxis to and from Manhattan. 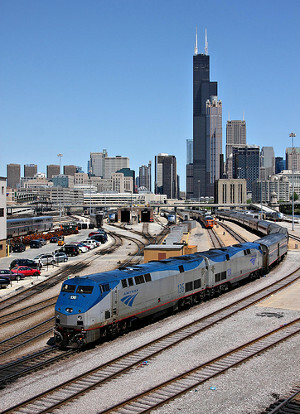 Passenger train service between New York and Chicago is provided by Amtrak. The journey takes between 19 and 21 hours. The ticket price varies from 100 to 600 $, depending on the class and whether you want to travel in a seat or have your own room with a bed. There is one daily direct train: The Lake Shore Limited. It leaves New York in the afternoon and arrives in Chicago in the morning. In the other direction, it leaves Chicago the evening and arrives in New York in the early morning. It is also possible to travel with the Capitol Limited, a daily train between Washington and Chicago. The connection New York-Washington is provided by the Northeastern Regional Service which runs several times a day. When traveling via Washington, New York has to be left in the morning and arrival in Chicago is scheduled for the early morning. In the other direction, it is better to change trains in Pittsburgh, from where the Pennsylvanian provides the connection to New York with arrival in the late afternoon. The departure in Chicago is in the early evening. In both cases you will travel between Penn Station in New York and Union Station in Chicago. Both stations are located in the downtown area. A bus needs between 18 to 23 hours to get from New York to Chicago. Tickets cost 170 $ and up for the return trip if booked in advance. There seems to be only one major company that offers bus service on this route: Greyhound. New York and Chicago are connected by the Interstate 80. The distance is about 790 miles (1270 kilometers), what should take 12-14 hours depending on how you drive. When calculating your driving cost, take in consideration that parts of the Interstate 80 are toll roads (Illinois, Indiana, Ohio). The following third party sites are listed for your convenience, all responsibility regarding their content is refused. Chicago Transit Authority (CTA): Bus and elevated train operator in Chicago. Metra: Suburban trains in the greater Chicago area. O'Hare International Airport: Chicago's main airport, 17 miles (27 km) from Downtown. Midway International Airport: Chicago's secondary airport, mainly for domestic flights. 10 miles (16 km) from Downtown. Gary Chicago Airport: Alternative airport for the Chicago area. Currently no service to New York. Chicago Rockford Airport:Alternative airport for the Chicago area. Currently no service to New York. Metropolitan Transportation Authority (MTA): New York Subway, Bus, Long Island Rail Road and Metro-North Trains. Port Authority Trans-Hudson (PATH): Rapid transit between Manhattan, New Jersey and Newark. New Jersey Transit: Rail service between New York and New Jersey. New York Waterway: Ferry and bus service in the port of New York. Staten Island Ferry: Free ferry service between Manhattan and Staten Island. Roosevelt Island Tramway: Aerial tramway between Manhattan and Roosevelt Island. John F. Kennedy International Airport (JFK): International airport in the borough of Queens. LaGuardia International Airport (LGA): International airport in the northern part of Queens. Newark Liberty International Airport (EWR): Airport in Newark also serving New York. Newark Airport Express: Bus shuttle between Newark and Manhattan. United: Chicago based airline offering almost hourly flights between New York and Chicago from 6am to 9pm. Continental: Subsidiary of United. Offering almost hourly flights between New York and Chicago from 6am to 9pm. American Airlines: Operating Hubs at O'Hare and JFK. Offering sometimes more than one flight per hour. Delta: Airline operating a Hub at New York JFK. Operating several flights a day from JFK， LGA， EWR to O'Hare and Midway. US Airways: Flights from New York to Chicago via Charlotte, North Carolina. Southwest Airlines: Low cost carrier flying from Chicago Midway to LaGuardia and Newark. JetBlue: Low cost carrier with direct flights from O'Hare to JFK. Spirit Airlines: Low cost carrier flying from O'Hare to LaGuardia. Amtrak: Train operator between New York and Chicago. Greyhound: Bus service between New York and Chicago. Fotopanorama.ch: Panoramic Pictures from Chicago, New York and more. Wikitravel New York: On-lineTravel Guide New York. Wikitravel Chicago: On-lineTravel Guide Chicago. newyorklogue.com: Site with more information about getting from New York to Chicago (or the other way around). montreal-toronto.com: Website about Montreal, Toronto and how to travel between those two cities. los-angeles-san-francisco.com: Website about how to travel from Los Angeles to San Francisco.